The Sewgood Crafter | where crafting feels sew good! Here is the box and necklace file with Joy Clair stamps added. For this The Cutting Cafe design team project, some of us collaborated with Joy Clair Stamps to create our projects. I used the Jewelry Holder Set from The Cutting Cafe to make earring and necklace holders and boxes, and the Shine Bright Stamp set from Joy Clair. One of my staff is heading a fun fair for her school and my mom made jewelry for her for the silent auction. I wanted to make a couple of cute boxes so this is what I came up with. I altered the file to remove the earring holder section and cut slits to make it a necklace card. This set features the earring card and I embossed the stamps with holographic embossing powder. I used the Shine Bright set from Joy Clair. 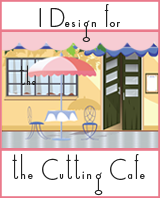 Be sure to stop by The Cutting Cafe Blog to see all the design team posts. We post on the 7th and 21st of each month. Leave a comment and you just might win three free files in a random drawing on the next design team post.